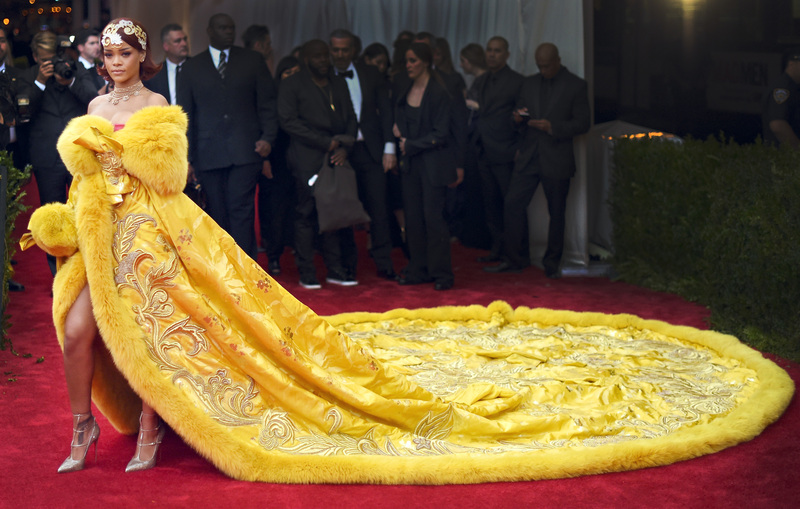 Rihanna looks like a golden goddess at the 2015 Met Gala in New York. Rihanna rocks an all-gold short suit style at the 2015 BET Awards. Rihanna arrives in a bright pink dress at the 57th Grammy Awards. Rihanna arrives in a long silk pink dress at a movie premiere. Rihanna arrives in a purple fur coat and pink boots at Coachella. Some might wear this as a cover-up, but Rihanna wore the sparkled robe with fur trim as a solo piece. Leave it to Rihanna to throw on a pink bath robe as a cover-up. Rihanna turned business casual into high fashion at the Tidal launch party in March. Rihanna is stunning in simple black at her album artwork reveal. Her denim flared mini dress is everything. Who says a long dress can’t be worn with pants? And here’s Rihanna nailing her Fashion Week ensemble at the Zac Posen show. This is what we call getting creative with denim. This is Rihanna’s ‘I’m in Paris’ look.